I’ve been trying to catch up on my Sons of Anarchy viewing. Since I gave up cable a few years ago, I’ve lost the thread and am a couple of seasons behind. It’s a violent show, and I’m not prone to violent fare. So, why try to catch up? Because the themes of violence and family run through the show in interesting ways. And that feeds my soapbox about churches that present themselves principally as a family. 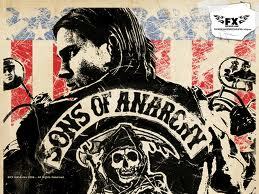 OK, so Sons of Anarchy is a drama about a motorcycle “club” in the little California village of Charming. They run guns and party hard and protect their turf from rival motorcycle clubs. They live violent lives. But we root for them because of the inner life of the club. They have a very thick and loyal inner life. They often express openly their love for one another. They hug each other more than I’m comfortable hugging other men. And they often refer to each other as family. It’s really tough to get into the circle, but once you’re in, you’re in. The circle of trust that allows them to function as a tight knit family requires that they trust no one else. No outsiders allowed. You don’t talk about the club with anyone else, especially not the police. The group is maintained by high and strict boundaries. And these boundaries are maintained by violence. Outside threats are dealt with through violence. Inner violations to the sanctity of the group are dealt with through violence. Now part of this is because they live as outlaws. But I’m convinced that all groups that have high boundaries and high inner conformity and loyalty resort to some measure of violence to keep their world intact, whether that’s through physical harm or some form of emotional coercion. I also think that the symbiosis between violence and “family” runs the other way as well. Their violence is made endurable because they have brothers in arms. As an aside, I’ve always been fascinated by the way football players greet each other after games. They’ve tried to kill each other for 60 minutes, but when the final whistle blows, they embrace each other, seek each other out, smile and laugh together. Baseball players don’t do this. Neither do basketball players, at least at the NBA level. They go their separate ways. But football players (and I think hockey players) honor their opponents after the game. And I’ve wondered if the violence of the game has something to do with this. That violence creates a certain kind of fraternity. OK, let me say this real quickly, family is not bad. In fact, there’s nothing better than good family. But family also carries with it this propensity toward maintaining itself through vigilant boundary maintenance, and that sometimes requires violence, whether coercion, exclusion, shame or physical harm. My suspicion of congregations that refer to themselves primarily as family is that their life is fairly tough to break into. When I do interviews with these congregations, two responses are fairly common: they are the friendliest bunch of people they’ve ever been a part of, and the church is hard to join or become a part of. Boundary maintenance trumps patterns of welcome. This is how they protect the intimacy they share as a family. This entry was posted in Christian practice, culture, theology and tagged family, Sons of Anarchy, violence. Bookmark the permalink. In “The Shaping of Things to Come: Innovation and Mission for the 21st Century Church,” Frost and Hirsch use the terms “bounded-set” and “centered-set.” My sense is that – at least, in many of our Church of Christ/Stone-Campbell Restoration experiences – our churches function a whole lot more as “bounded-set people” rather than as “centered-set people.” (I sense that’s changing, especially with this emerging generation of which I’m a part, but that was certainly the case in my parents’ generation and, even more so, in my grandparents’ generation. I would argue that this kind of change is for the better.) The former means creating lots of rules and enforcing/maintaining all kinds of rigid boundaries and neatly-defined categories; making sure those on the outside don’t get in and those on the inside don’t get out; etc. It’s an “us-versus-them” mentality. No room and space for people who aren’t “like us.” But when I read the New Testament, and when I witness the hospitality/koinonia/table fellowship that defines the very ministries of Jesus and the early Christians (particularly in Luke-Acts), I catch a much different vision that seems to be more in line with the latter. I’m wondering you could help us to unpack this even further, using Frost and Hirsch’s terms of “bounded-set” and “centered-set.” Talk about the church as a “bounded-set” community and as a “centered-set” community. Mark, don’t know if you’ve reflected more on how to address this, but if you have I’m definitely interested in hearing more about this topic. I’m especially interested in how we can identify the particular behaviors that our community manifests, help our people be aware of it and encourage the practice of hospitality. There are many different and subtle ways to exercise coercion, exclusion and shame – often going unnoticed by the person performing the action. I think it would be interested to know what is going on in the heads of our people when they see a visitor among us. I think there are all kinds of different responses – fear, excitement, suspicion, etc…. I just find it interesting because our church has been talking about how relationships/community are perceived by our people as both a strength and a challenge (particularly the challenge of “getting In” although we’ve had a handful of people in the last couple of years do it pretty effectively). Hope you have more thoughts, regardless its good stuff to chew on and I appreciate your post. Robby, I’ve been away from the blog for awhile. I do have a few thoughts about this. It was my one big blindspot while I was at EC. I will say that congregations that trade on intimacy, even if its a faux intimacy, have a hard time welcoming the other. So, there has to be a way to be conscious about trading on other values. I think about two congregations our grad students visit. One is a very hip, emergent congregation that is very informal in their gatherings. They equate “relaxed” with hospitable. But relaxed works only if you are already in, because the rules of belonging are not clear for outsiders if they’re all implicit. They all go away impressed by the music, but unwelcome, spectators to someone else’s life. We also attend that same day an Episcopal congregation that depends on the “rules” or structure of the liturgy to provide a welcome. Our students always expect to feel less welcomed there because of the “ritual” nature of the welcome. But they come away feeling just the opposite. Now, I think that this particular Episcopal church does a very good job in being competent in the welcoming aspects of the liturgy. But they don’t trade on intimacy or family in the same sense of the emergent congregation, and yet do a better job of welcoming. I’ll try to say more about this as I go along. There’s church culture, and then there’s individual behavior within that culture. What can individuals do to welcome newcomers into an intimate mix. I often find myself caught between the two pulls: as a way of bringing newbies up to speed within a church context, do I warn them of the landmines they’re approaching when they have great ideas to try out, or is it more loving to sit back and watch what happens? I find either approach deflating. Susan, tough call. This is why I think congregations need open and dependable processes.